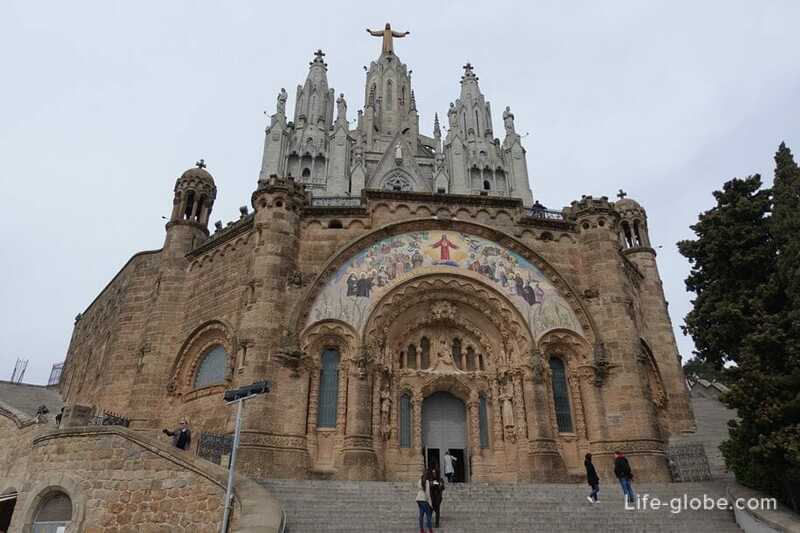 The top of the Tibidabo mountain majestically decorates the Church of the sacred Heart, the full name of the Expiatory temple of the sacred Heart of Jesus (Temple Expiatori del Sagrat Cor / Templo Expiatorio del Sagrado Corazon de Jesus), has already become one of the landmarks of Barcelona. 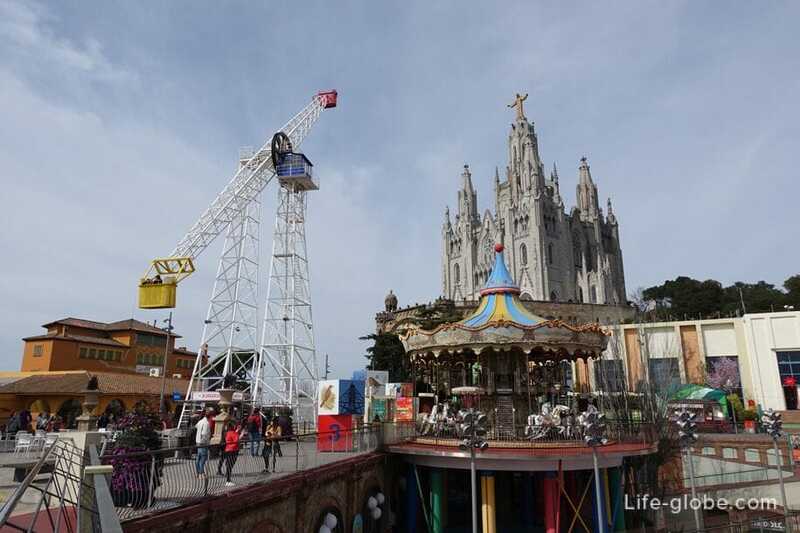 And at the foot of the temple on top of a mountain and partly on the slope, is the namesake amusement Park and attractions (Parque de Atracciones Tibidabo). 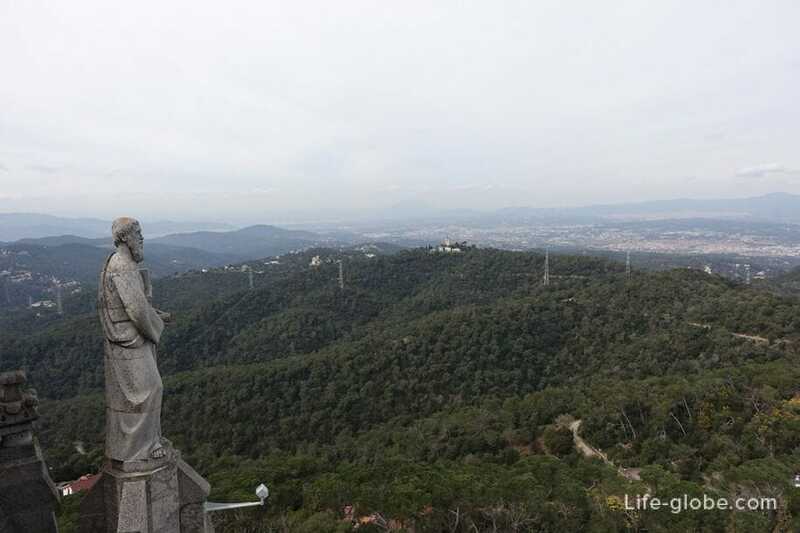 Even if you are not a fan of religious shrines and amusement parks, to climb the mountain Tibidabo in Barcelona still stands. 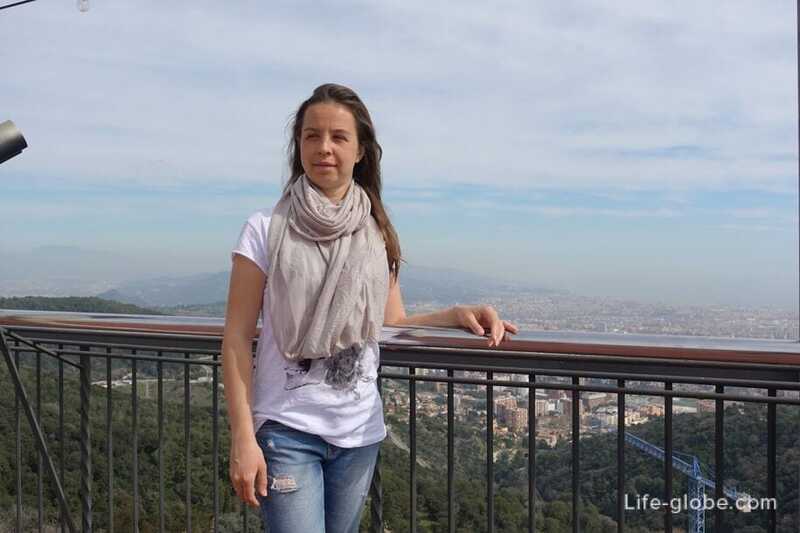 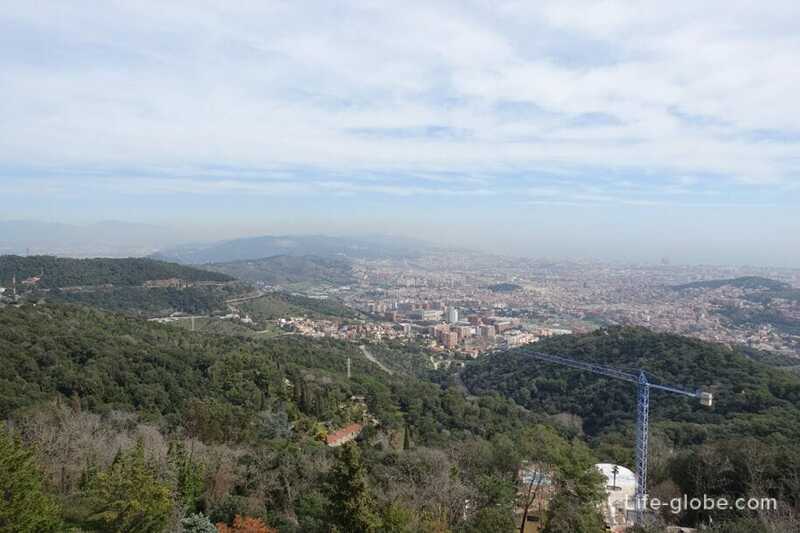 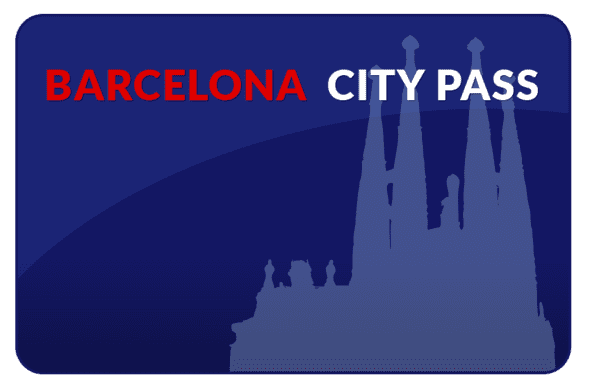 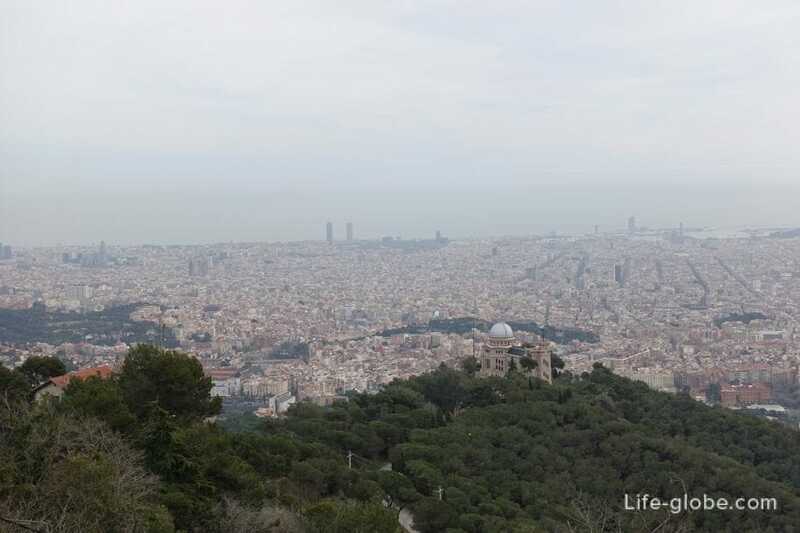 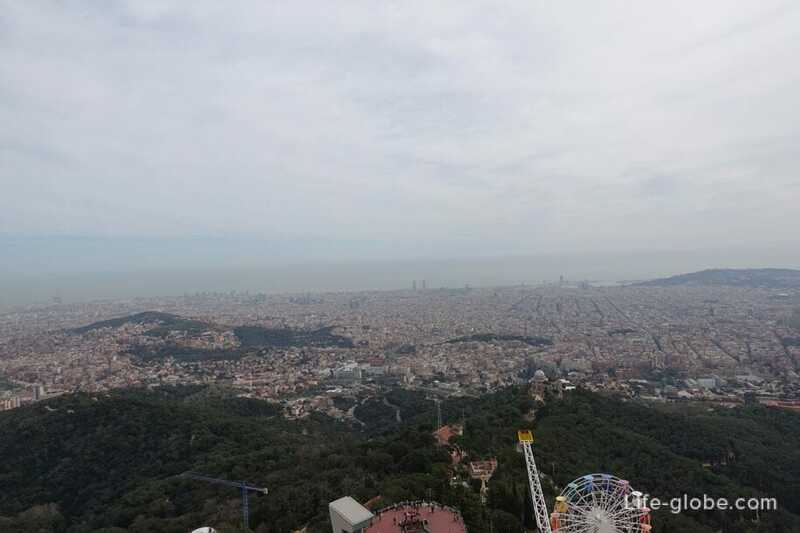 First, near the temple and the Park is equipped with observation decks which offer stunning views of the entire city of Barcelona and surroundings, as well as the Mediterranean (Balearic) sea. 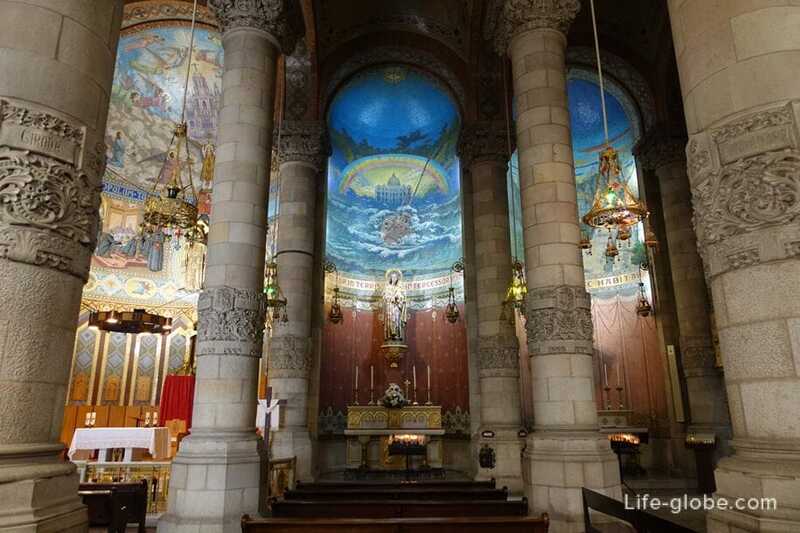 Second, the temple of the sacred Heart consists of an ensemble of two separate churches where one is located on the second, combines several architectural styles and visually is a very interesting object. 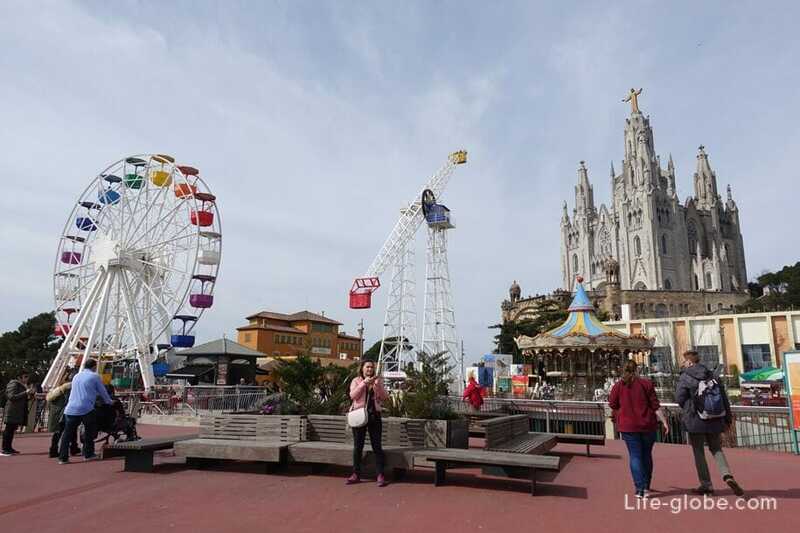 Tibidabo amusement Park has an area of 70 000 m2 and is the first amusement Park in Spain and one of the oldest in the world. 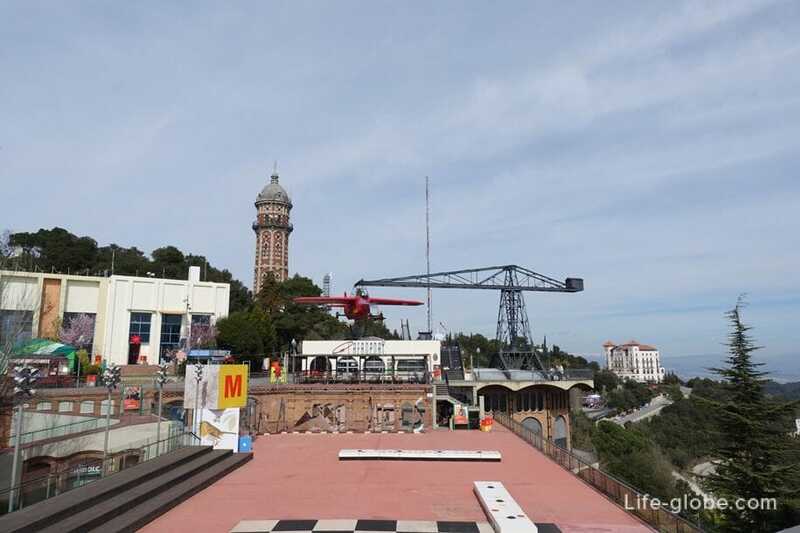 The Park was built in 1899 and opened in 1905. 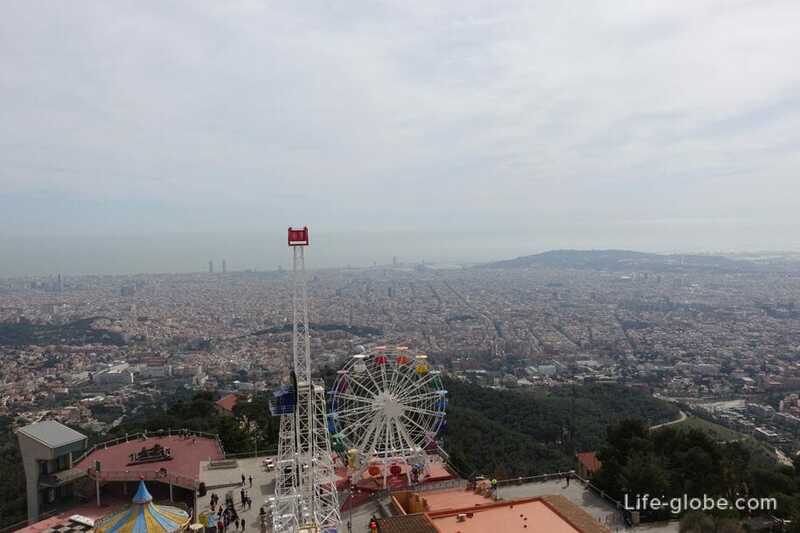 Full Park open in the summer period. 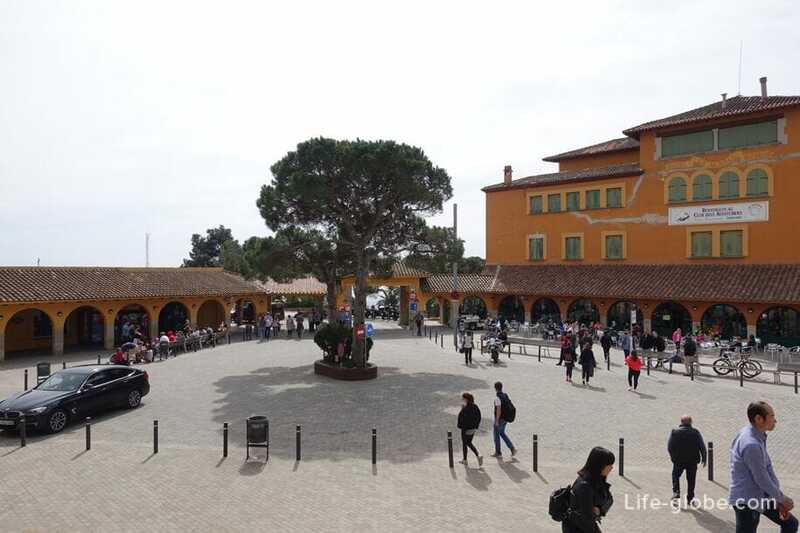 The date of the opening of the Park changes every year, but, roughly, the Park opens its doors to visitors from early may. 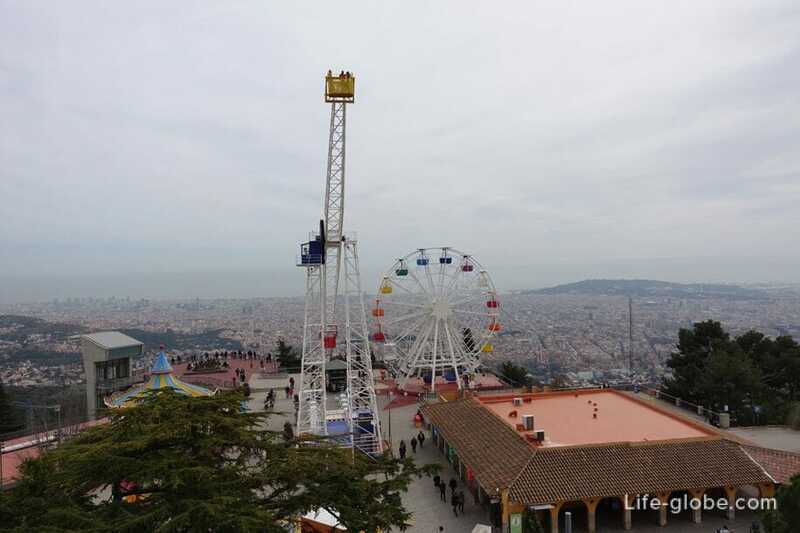 However, even in the off-season, the Park has separate rides, tickets for which can be purchased at the Park's ticket offices, located at the entrance. 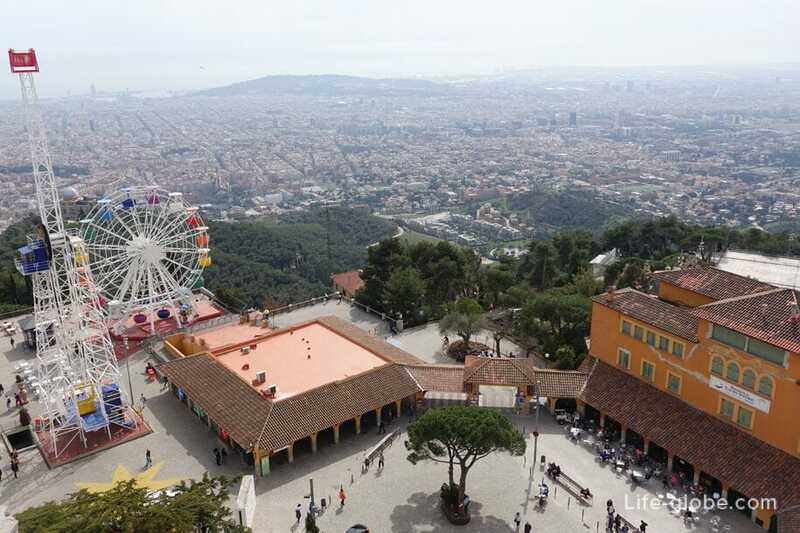 To know the exact dates and hours of operation Park and Tibidabo, as well as plan your visit and buy the ticket to summer time on the official website of the Park. 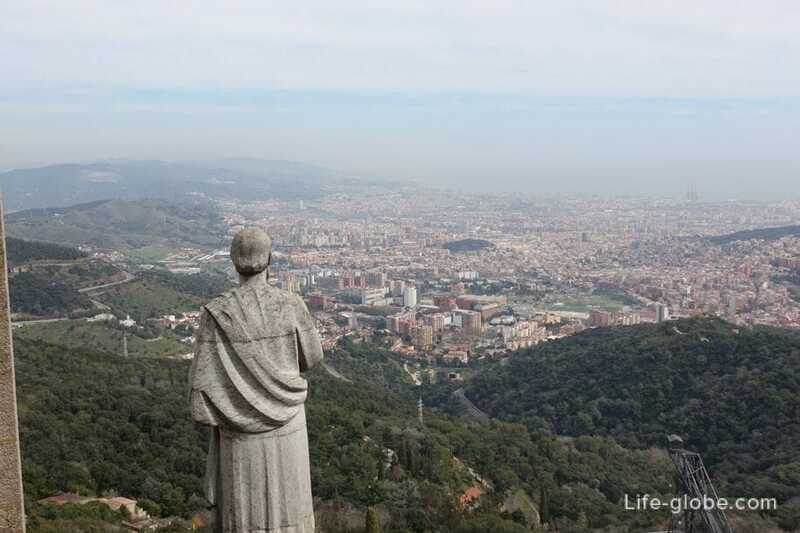 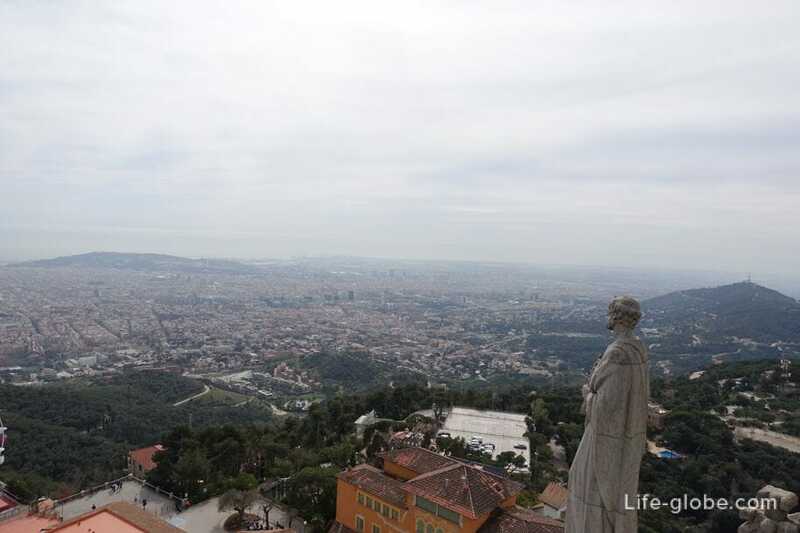 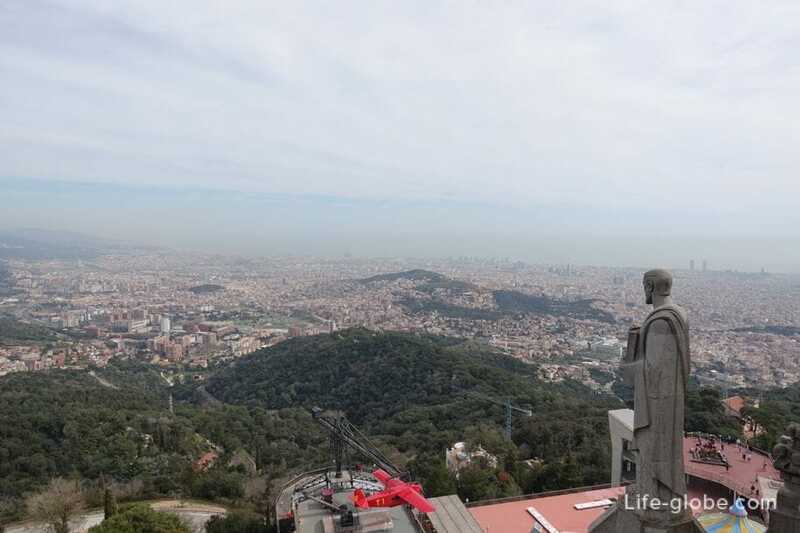 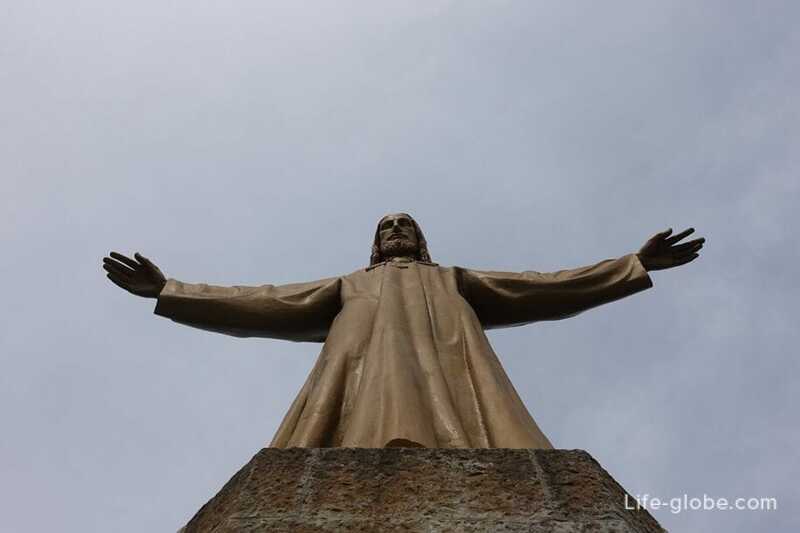 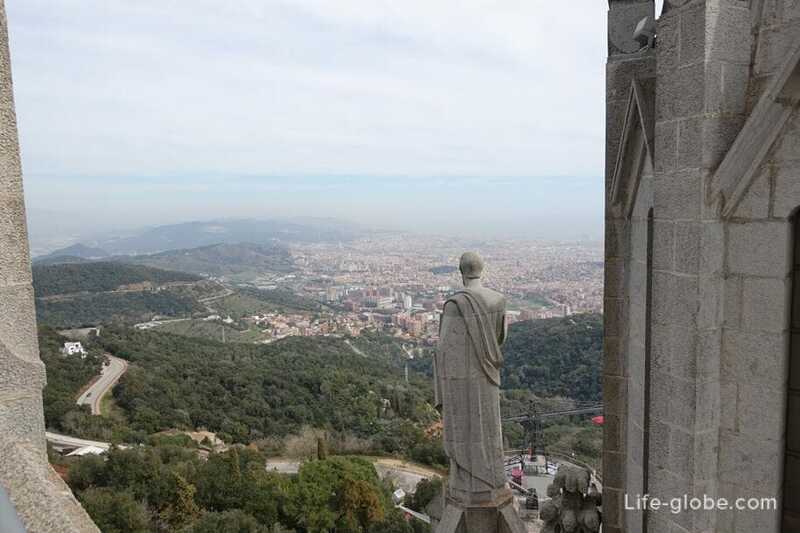 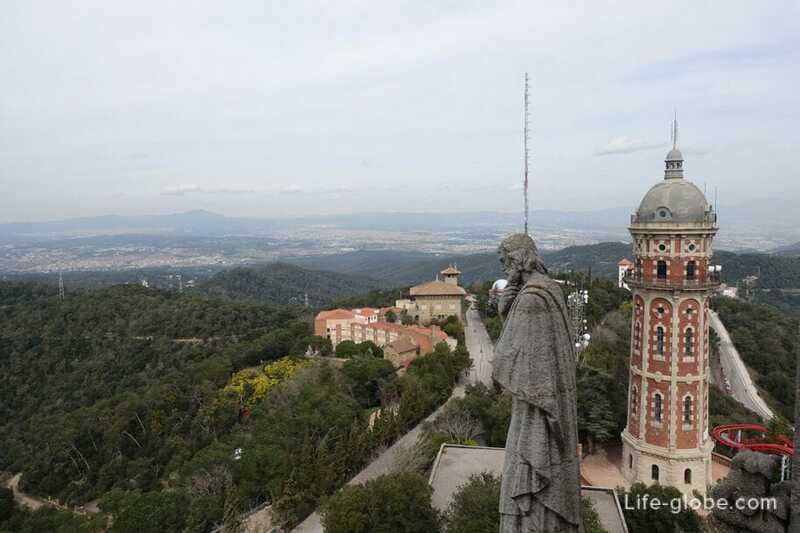 Most tourists, when visiting the Tibidabo mountain, of special interest is the temple of the sacred Heart. 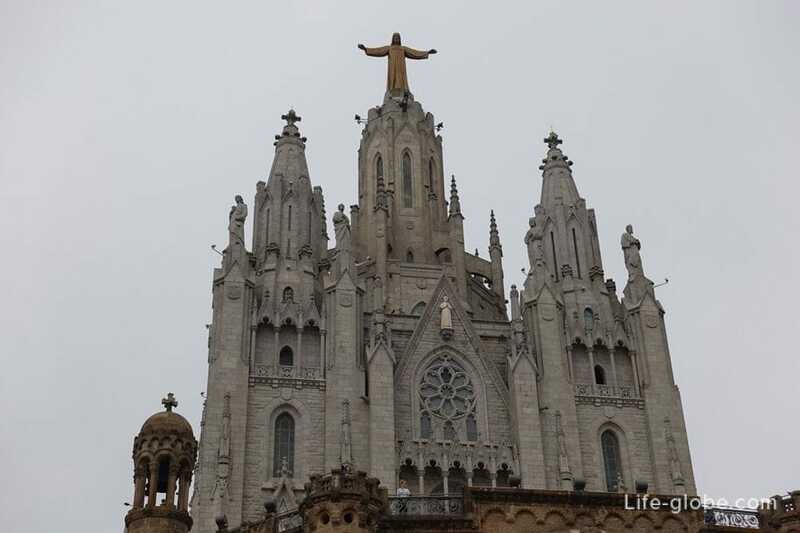 Expiatory Church of the sacred Heart of Jesus - the Central building on mount Tibidabo, the monumental ensemble, crowning a mountain top Tibidabo and consisting of the Roman Catholic Church and minor Basilica, where a Church was built on the other. 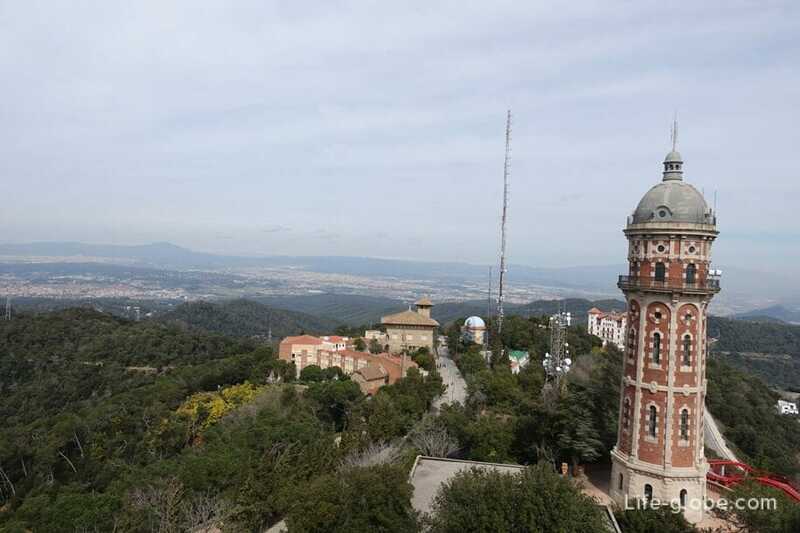 The construction of the complex was carried out in several stages, from 1886 to 1961. 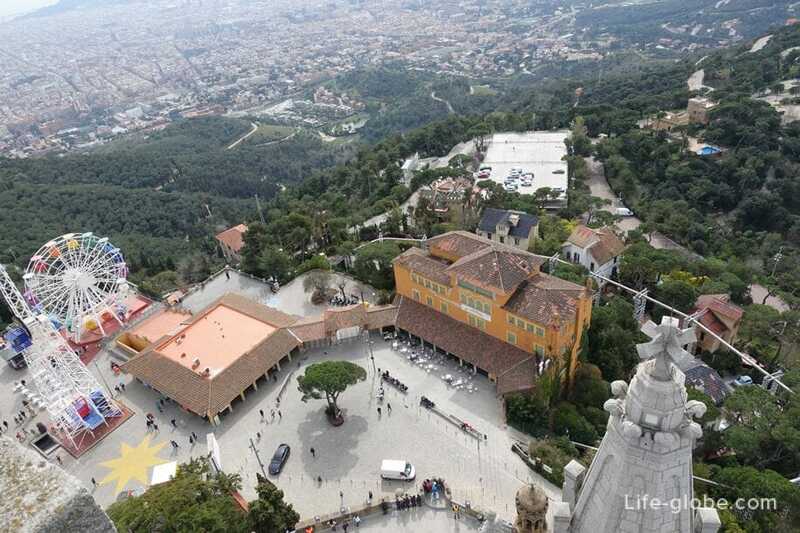 On the same name of Tibidabo Square (Placa Tibidabo), near the foot of the temple, there are a cafe and funicular Tibidabo. 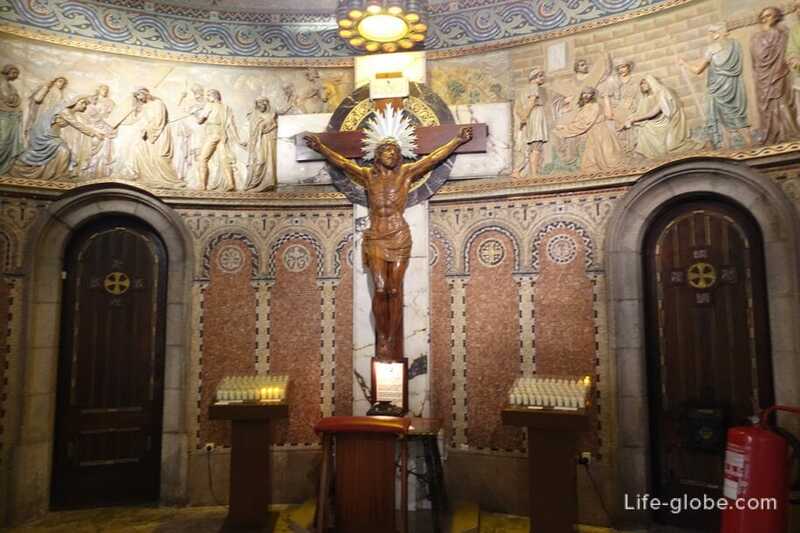 The lower Church is the crypt, leads to the sweeping staircase, and the top is crowned with a large bronze statue of Christ, the architect Enrique Sagnier. 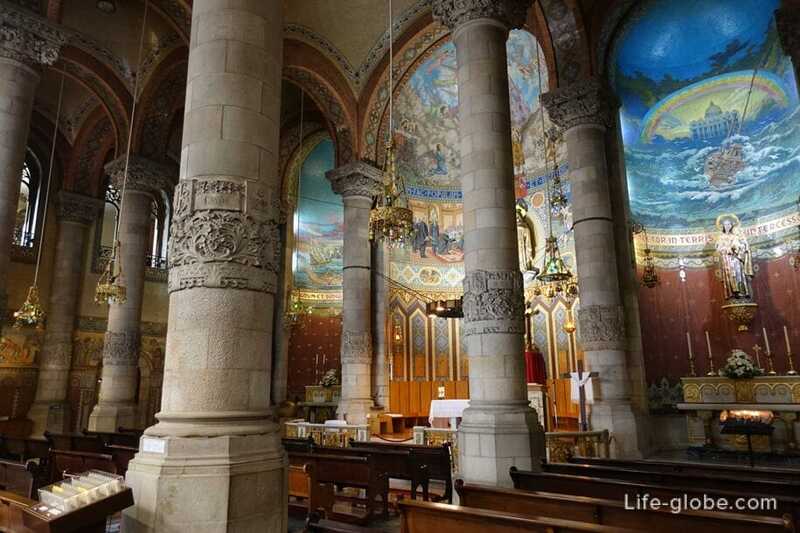 The lower Church combines neo-Gothic and classical elements with a number of jewelry style of modernism. 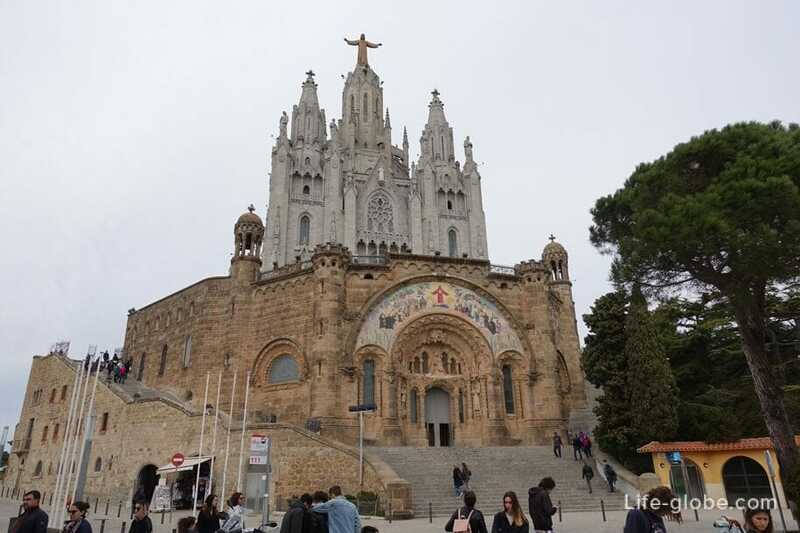 It was opened on 18 June 1911. 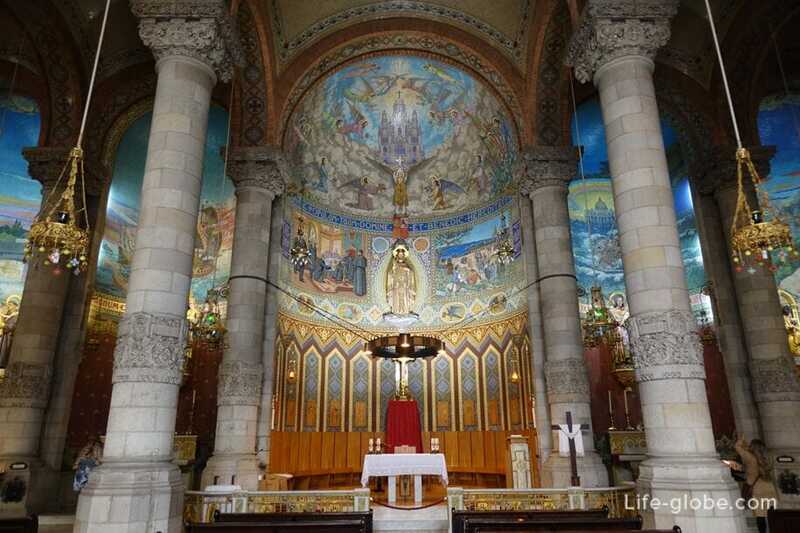 The upper Church was built between 1915 and 1951. 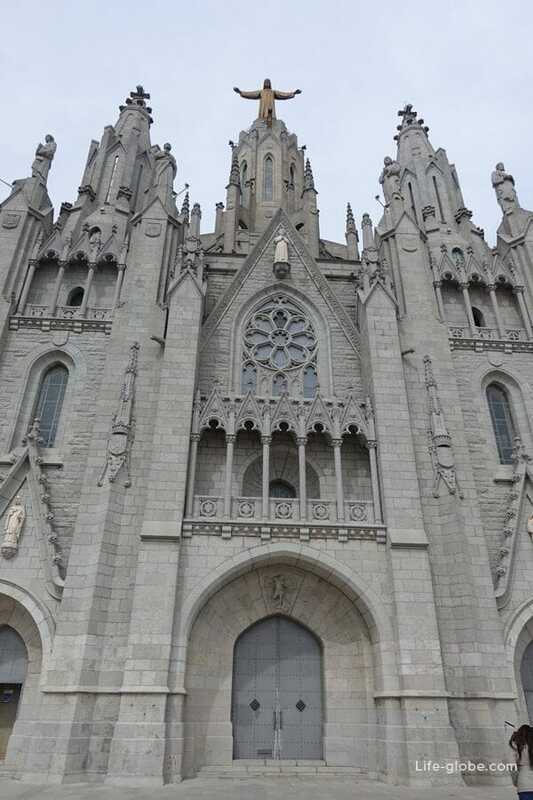 Officially, the work on the temple was finished in 1961, when it was built two last tower. 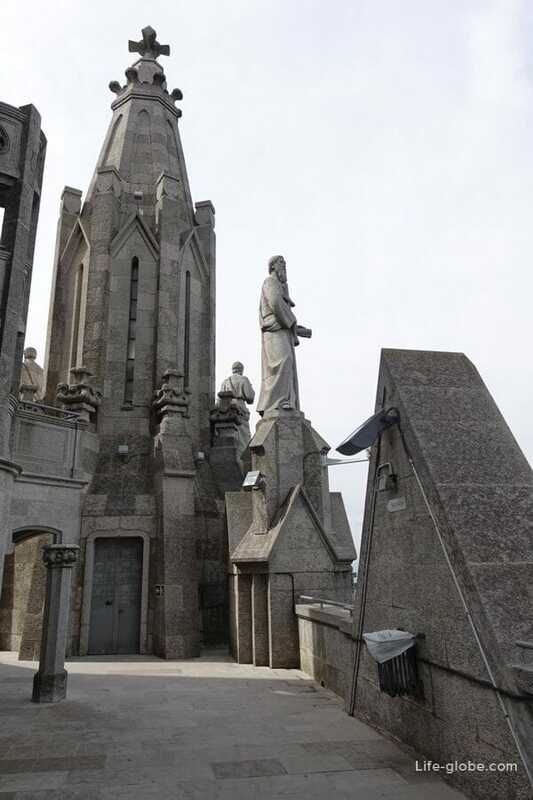 The building was constructed in bluish-grey stone and very different from the bottom of the crypt. 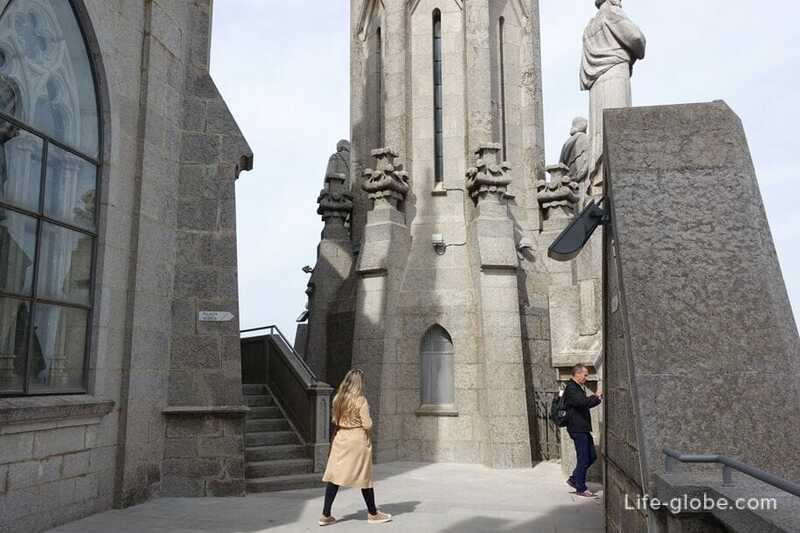 The steps to the observation deck located on the roof of the lower Church, and views of Barcelona the neighborhood and Tibidabo amusement Park. 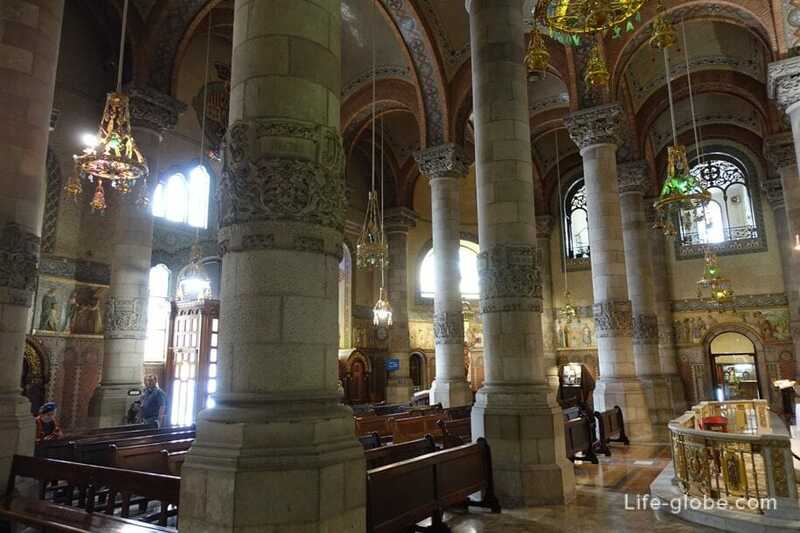 The interior of the lower temple is simple, but quite luxurious. 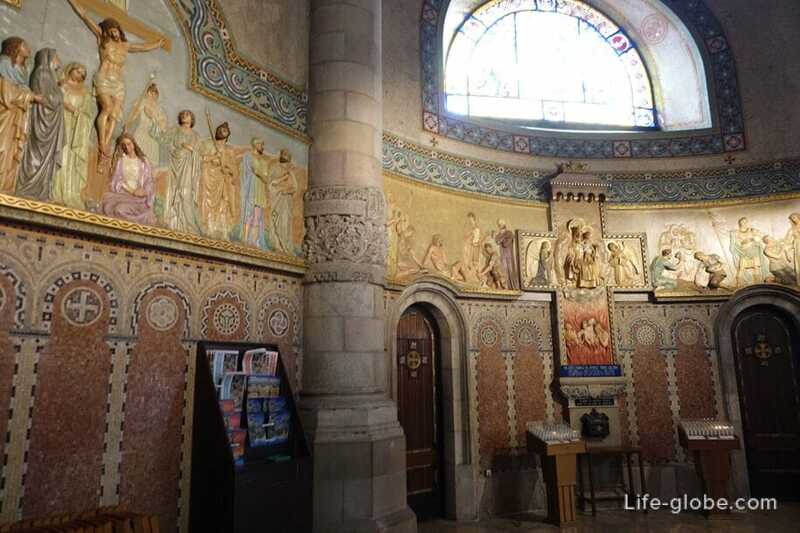 The Central part of the inner hall is decorated with a mosaic with three biblical scenes. 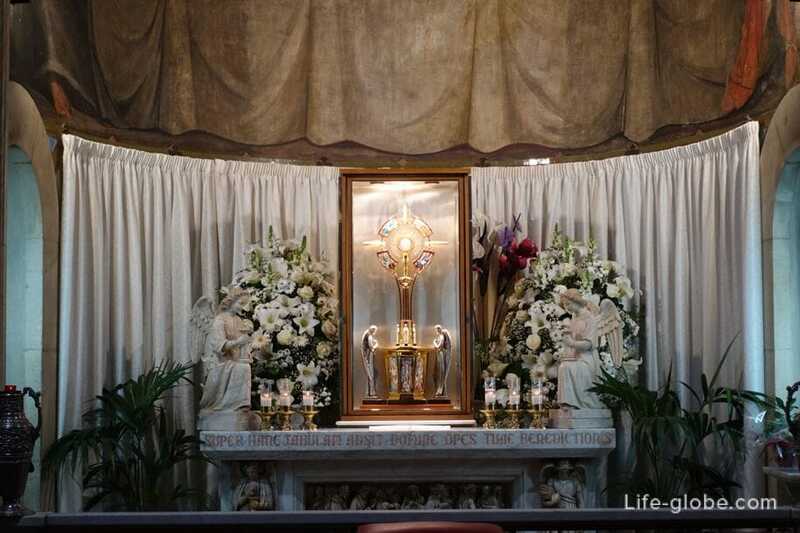 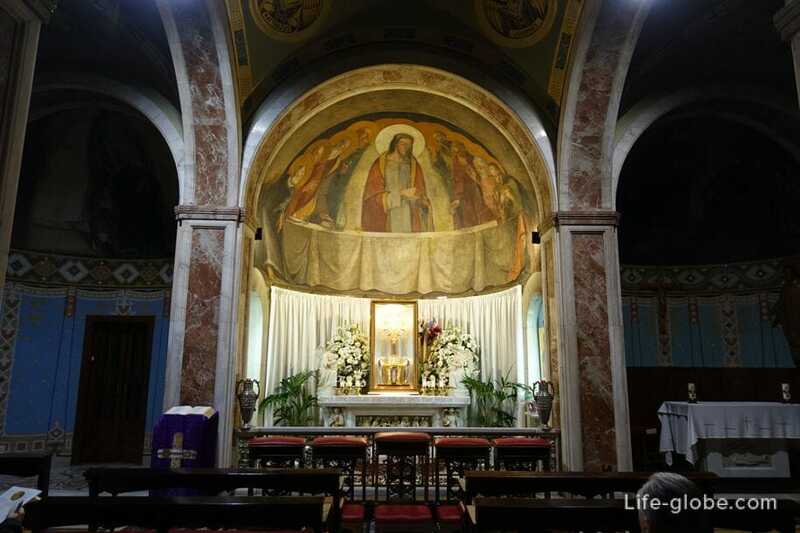 On the right side of the main hall is a chapel of Endless worship of the Holy Eucharist, the center of which you can see a picture of the last Supper, the work of Miquel farre (1947-1949 gg.). 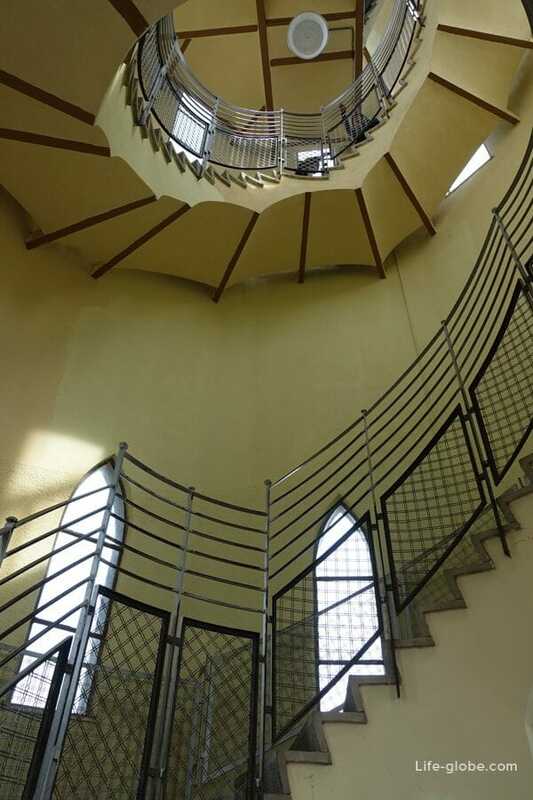 If from the Central hall pass in the left door, then get into small hall, from which you can go to the Elevator. 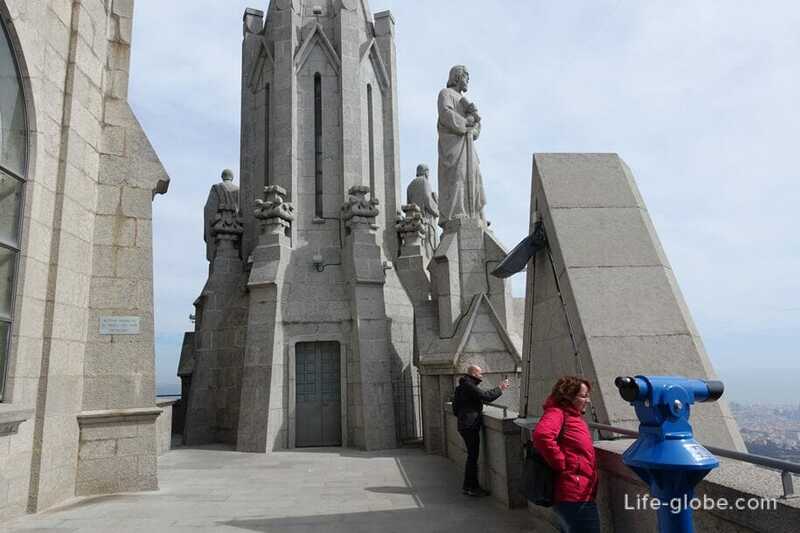 On the Elevator you can climb to the terrace of the temple, located at an altitude of 538,87 meters and then walk the stairs to the balcony of the temple, located at the base of the upper dome (the pedestal for the statue of Christ) at the height of 564,43 meters above sea level. 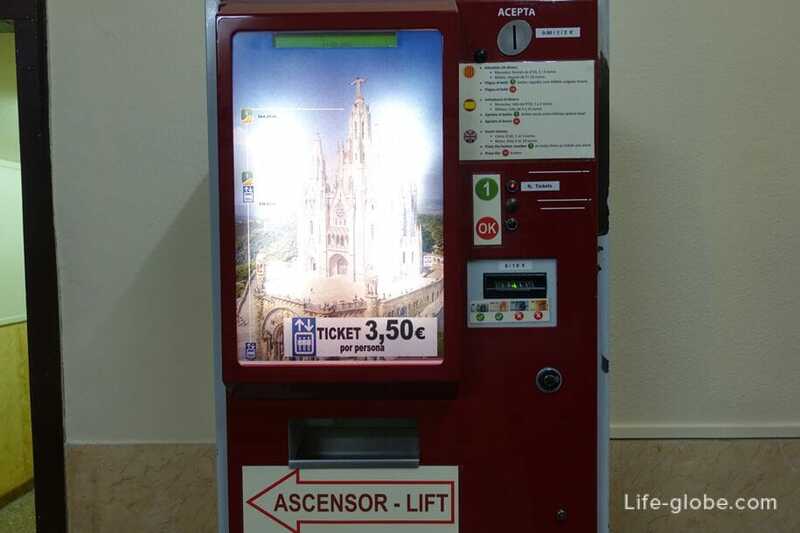 Lift paid near the Elevator is a machine where you buy tickets. 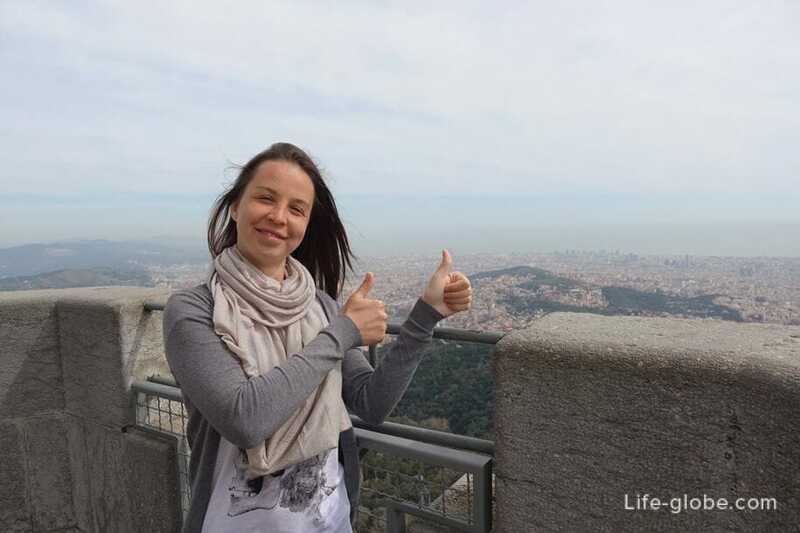 The ticket cost 3,50 Euro. 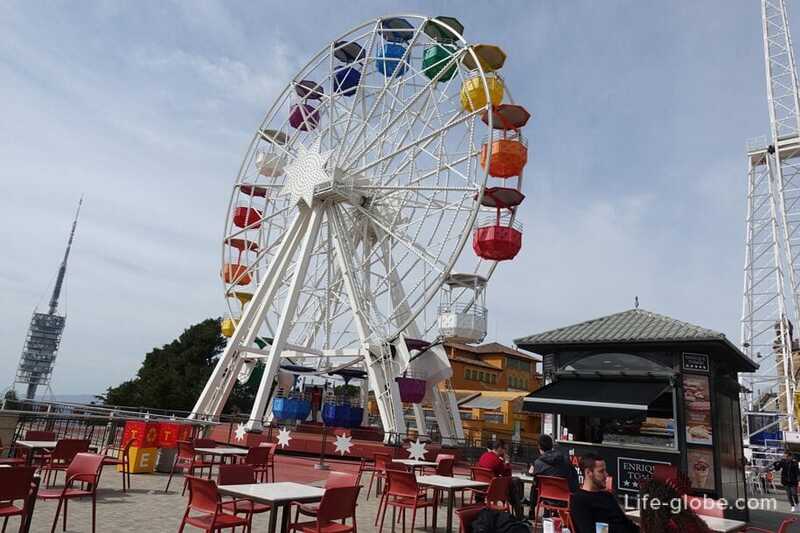 The machine accepts paper money in 5 and 10 Euros, and also coins face value of 0.50 Euro cents, 1 and 2 Euros. 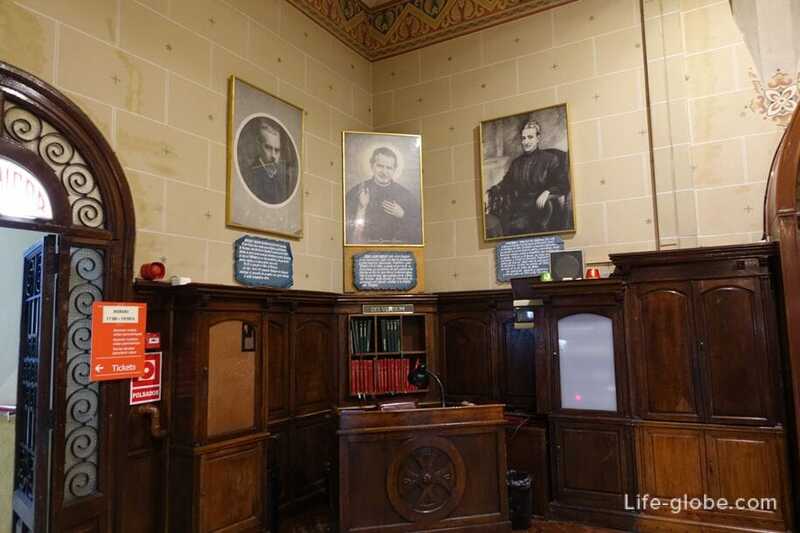 Next, go into the Elevator, which the officer of the temple checks the tickets. 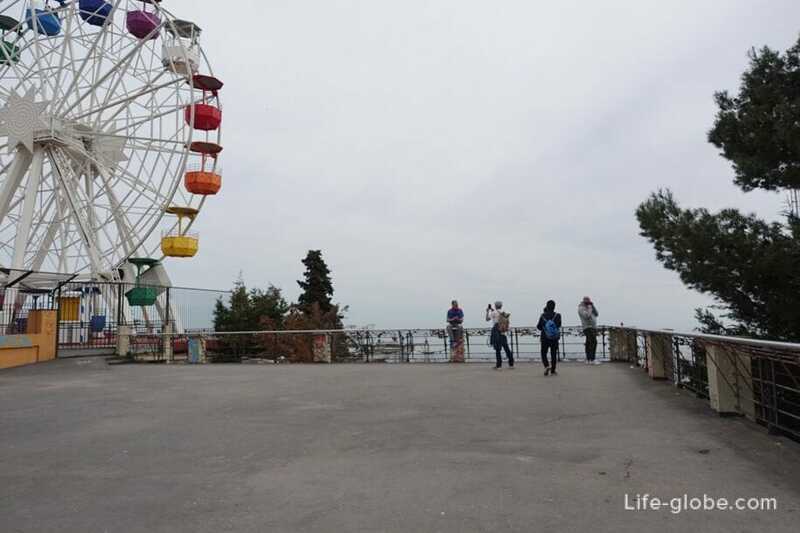 The Elevator went up to the open circular terrace. 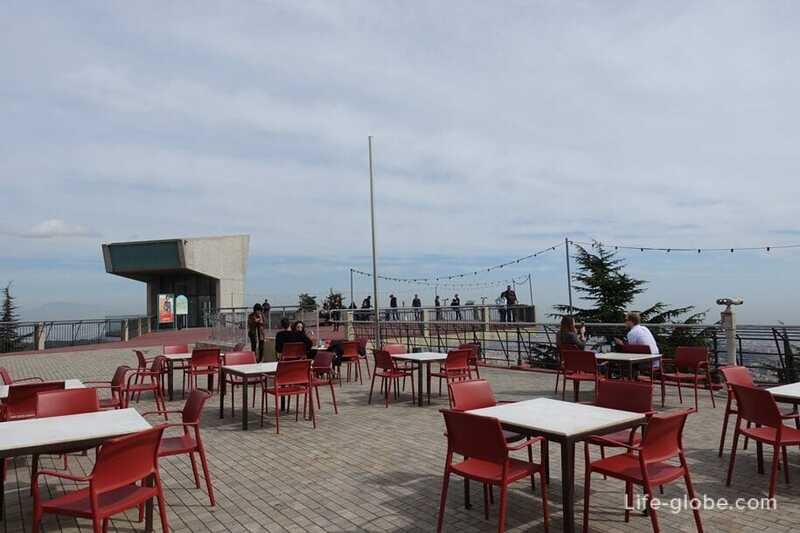 The types that opens from this terrace, in Barcelona, the Mediterranean coast and the surroundings just stunning. 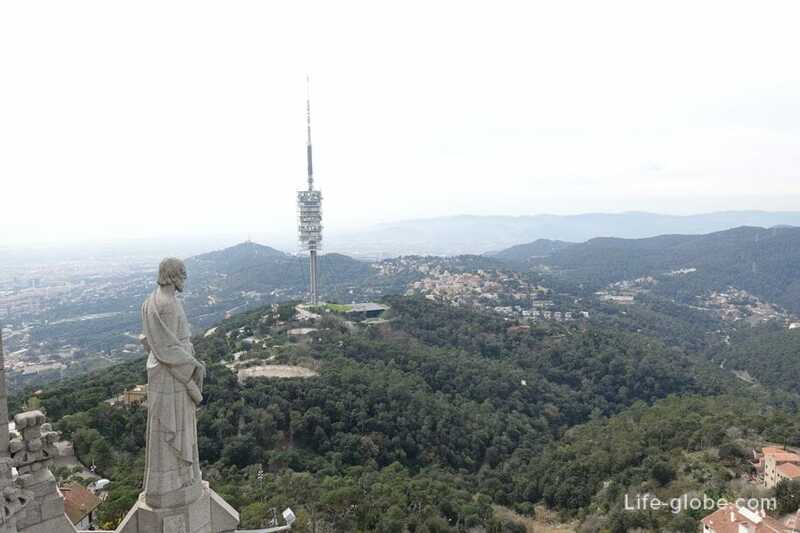 Views another attraction of Tibidabo, although highly questionable for such big words as "Attraction", the Collserola Tower (Torre de Collserola). 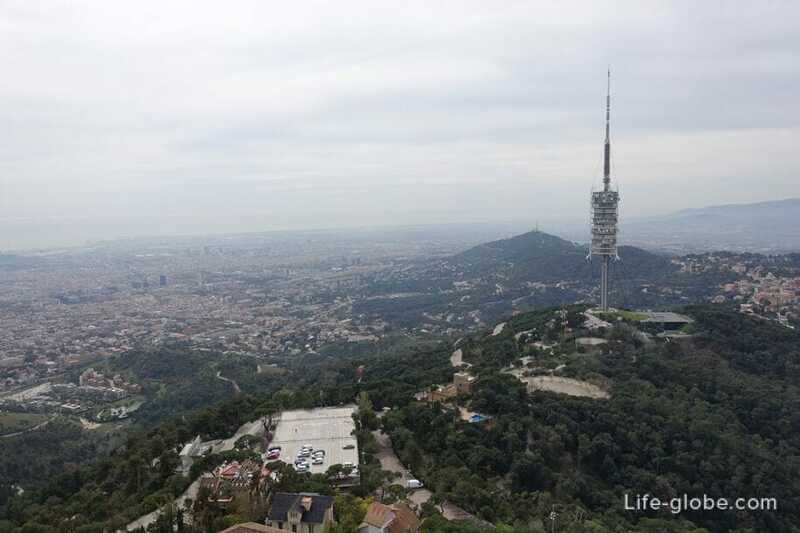 On the 10th floor of the Tower is a public point of view (560 meters above sea level) and is accessed by Elevator and enjoy the views of Barcelona. 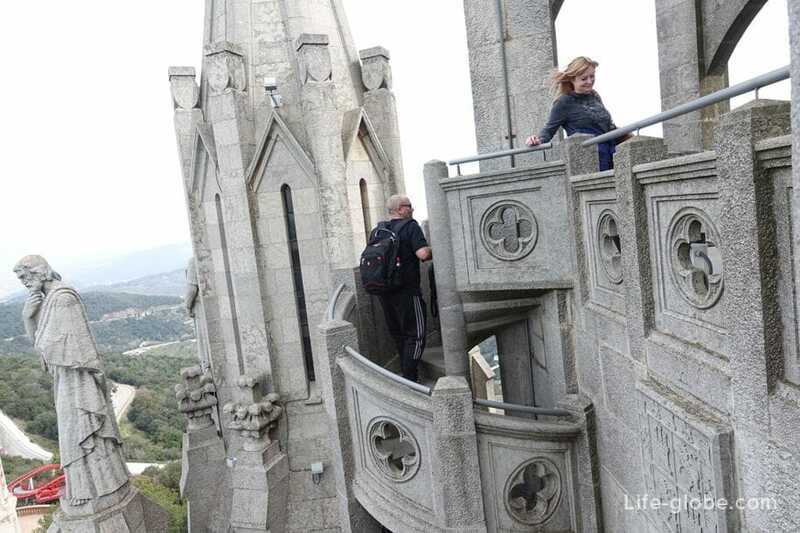 Hours of operation the observation point of the Tower and the ticket price can be check at official website. 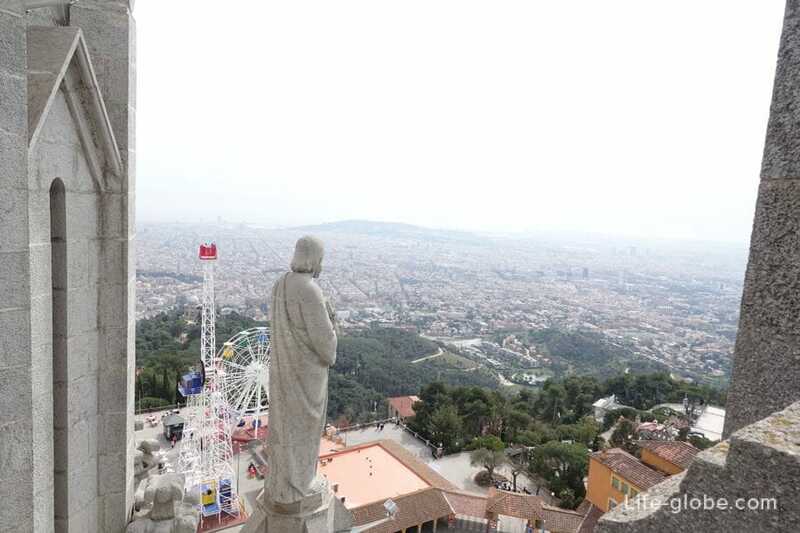 Then a spiral staircase going to the upper observation platform of the temple of Tibidabo. 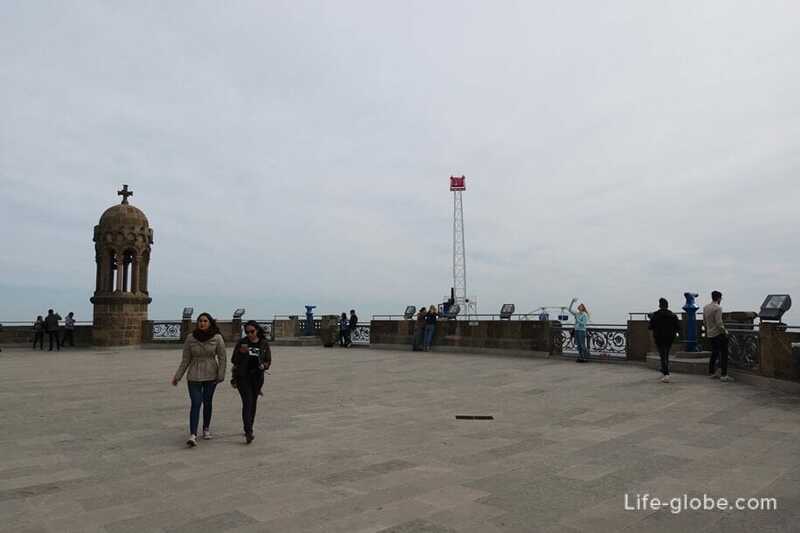 This area is a outdoor balcony with a 360-degree review. 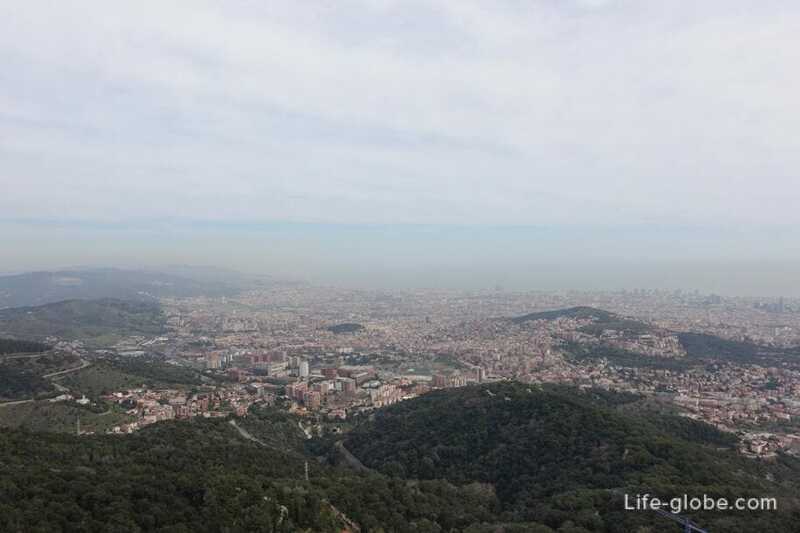 The balcony offers the city's best panoramic views of Barcelona and the surrounding area. 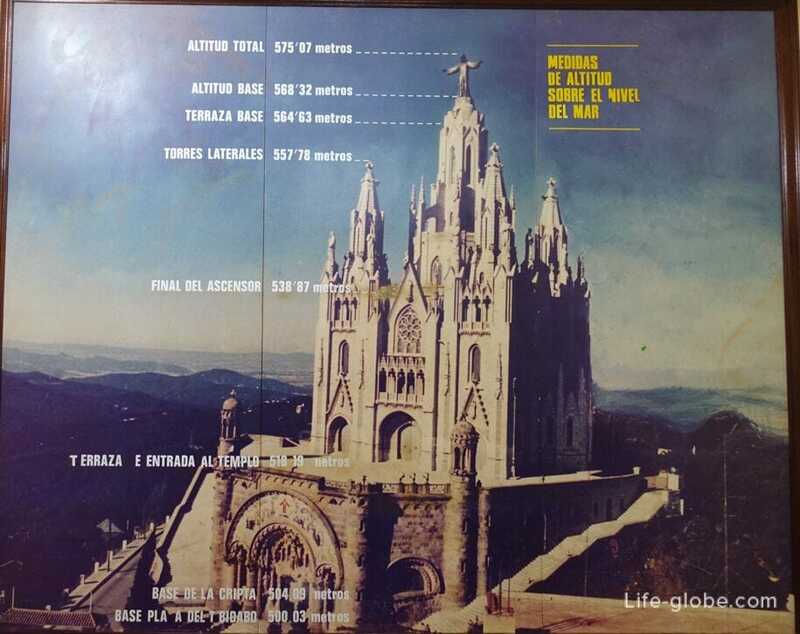 Opening hours of the lift in the Temple of Tibidabo is open daily from 11:00 to 19:00 hours. 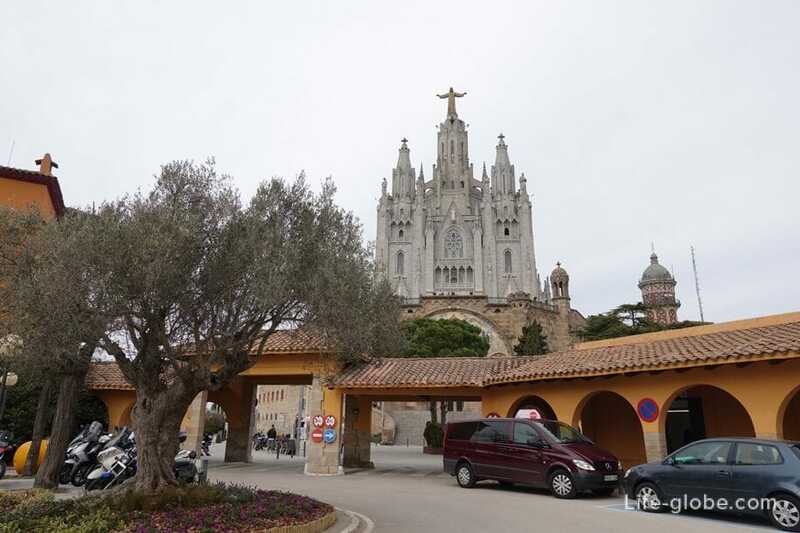 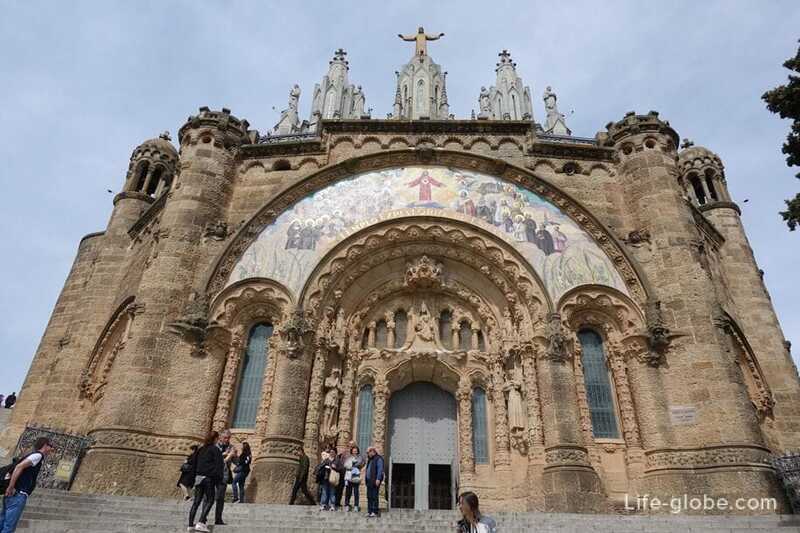 Opening hours of the temple of Tibidabo is open daily from 11:00 to 20:00 hours. 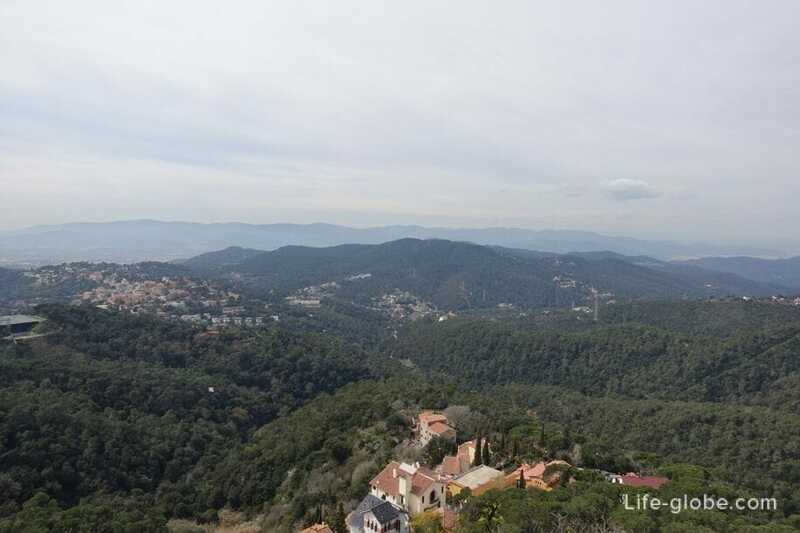 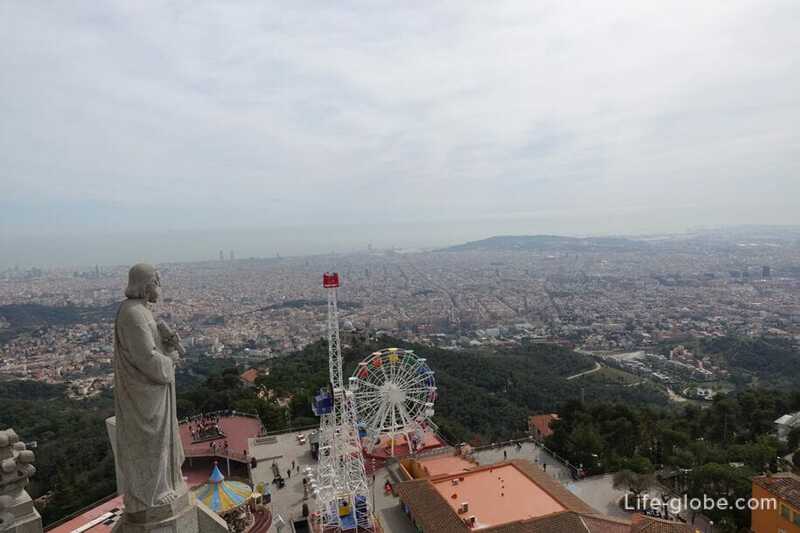 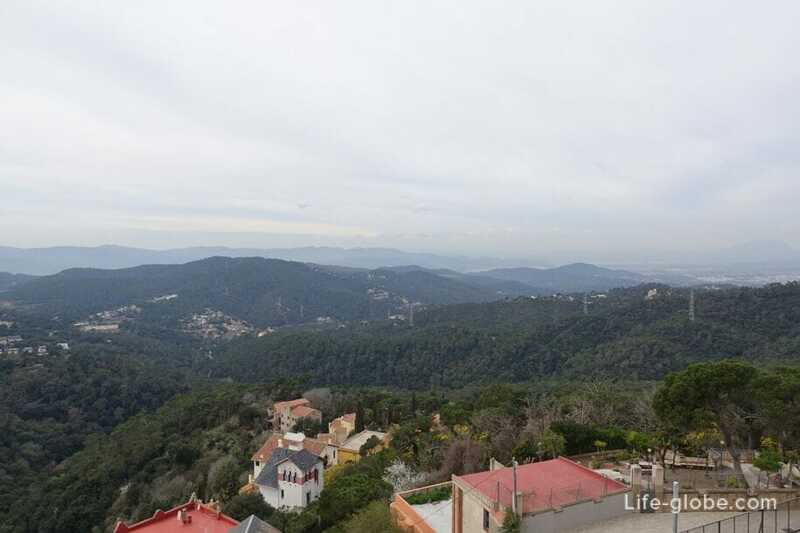 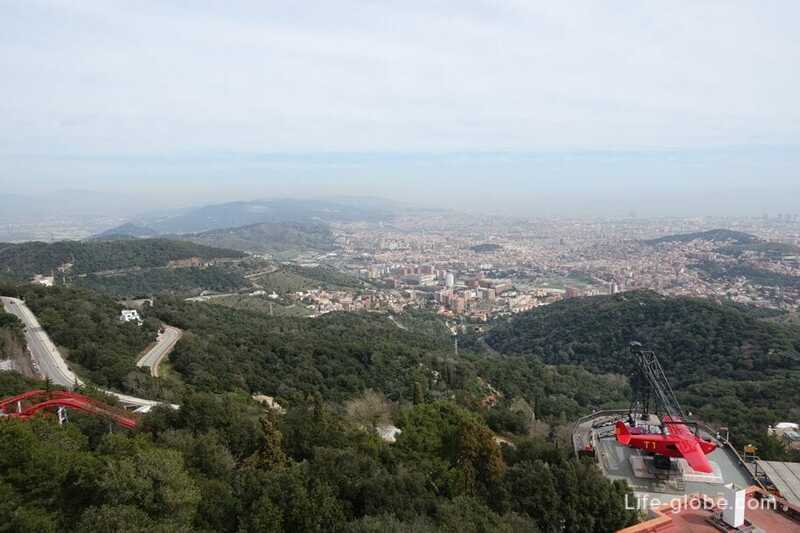 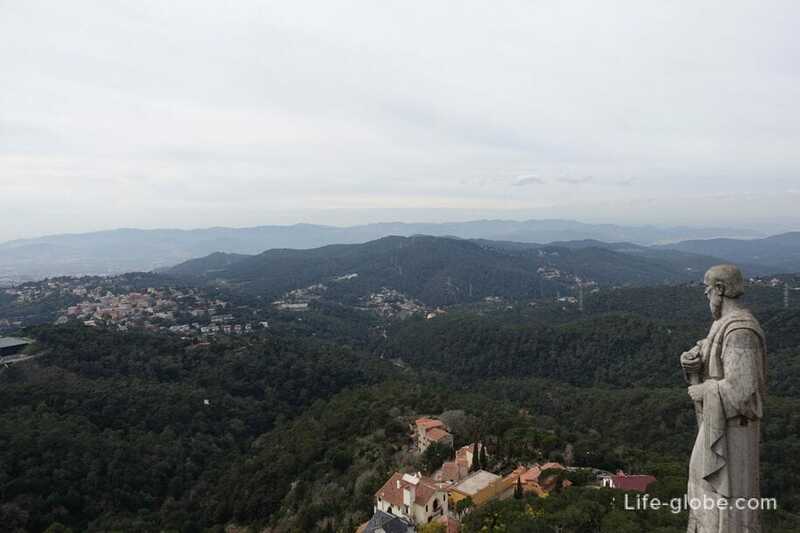 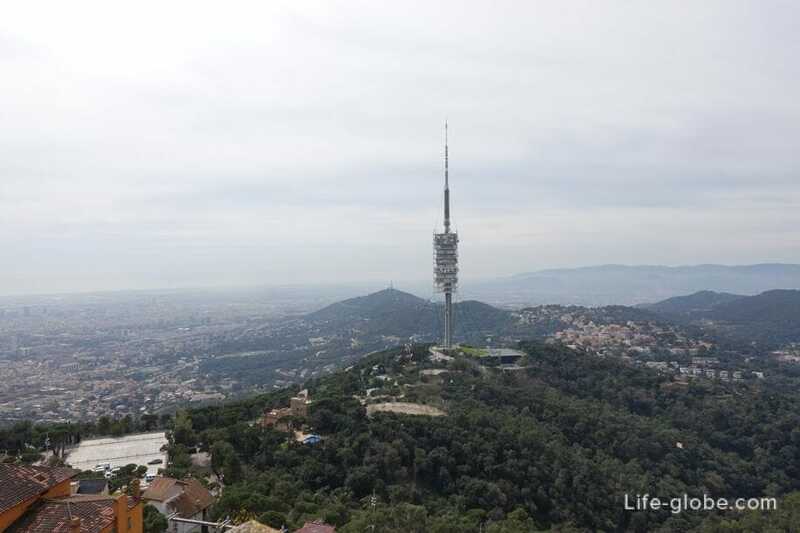 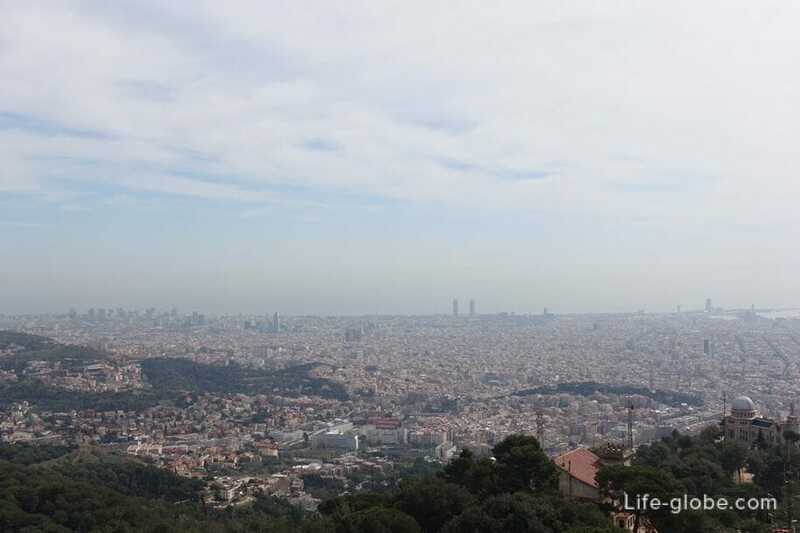 Visit the mountain of Tibidabo with one of the excursions. 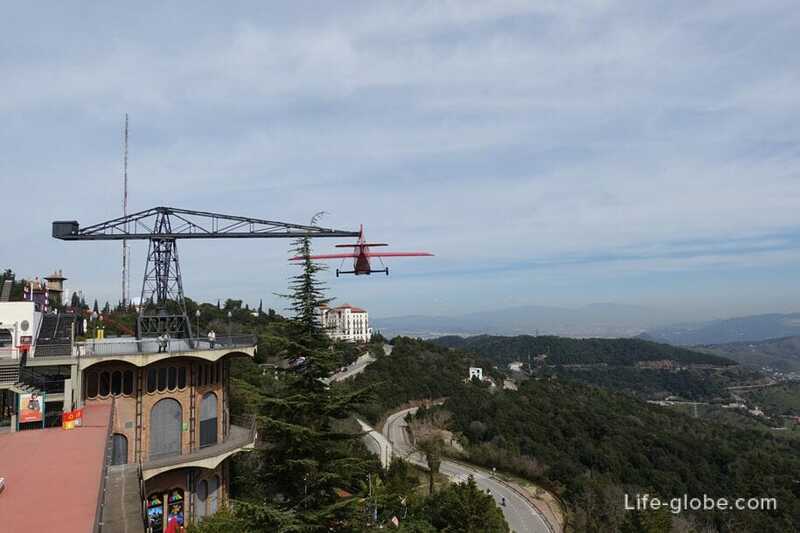 As well as by car, taxi, cable car, bus or even on foot. 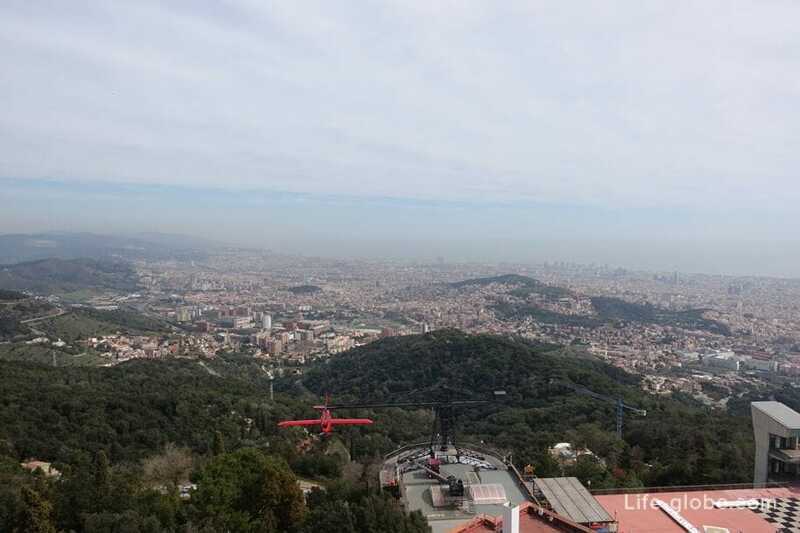 Read more about all the ways how to get from Barcelona city centre to Tibidabo mountain can be found here.